Almost a hundred years after its discovery, KV 55 remains a subject of controversy. The evidence uncovered in the tomb is especially difficult to interpret because no one living today can be certain of exactly how things were found when Theodore Davis, Edward Ayrton, Arthur Weigall, and Gaston Maspero first entered the tomb. The written accounts produced by these men all contain discrepancies which make it impossible to formulate a clear, unambiguous version of the discovery. 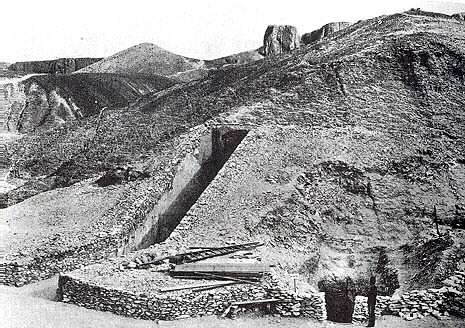 Worse, no one can even be sure of exactly what was found in KV 55 because some of the smaller objects were stolen by Davis's workers when the tomb was first opened, and were never included in Daressy's catalogue of the tomb's contents printed in Davis's The Tomb of Queen Tiyi (London, 1910.) Still other valuable artifacts (including the coffin basin which contained the much-discussed KV 55 mummy) were later stolen from the Cairo Museum, or misplaced and forgotten within its labyrinthine expanse of galleries, storage rooms and offices. Over the years, some of these priceless relics of the Amarna period have resurfaced. Others, however, remain elusive. It is possible to trace their movements through the hands of various collectors up to a certain point, and then the trail abruptly ends. In what follows, some of the more rewarding trails are charted. They lead the traveler through a strange world of antiquities dealers, secretive collectors, old diaries, forgotten museum ledgers, and elite auctions. For John A. Larson, Museum Archivist of the Oriental Institute of Chicago, the trail to some of KV 55's missing objects opened unexpectedly on January 18'th, 1990, when he stumbled across a letter that had been sent to the Institute by a John W. Allen of Tallahassee, Florida, in February, 1958. Mr. Allen, a great-nephew of Theodore Davis, had wanted to know if the O. I. C. would be interested in acquiring a collection of Egyptian antiquities that had once belonged to Davis. 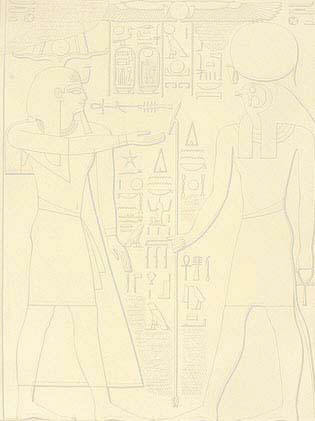 He also sent along a catalogue which described and illustrated the antiquities, and Larson soon realized that he was looking at ink sketches of objects that had originally come from KV 55. Sparked by this unexpected discovery, Larson embarked on a fascinating historical quest that he chronicled in KMT (1: 2), 43-46. Aware that the artifacts in Allen's catalogue were those mentioned by Andrews in her diary entry, Larson investigated further and discovered (through the Andrews diary) that Carter helped Davis trace the stolen objects to two Luxor antiquities dealers named Abd el Hamed and Ali. Ali returned the articles to Davis and would not accept payment for them. Davis kept these objects, probably realizing that he could not include such stolen items with the rest of the KV 55 antiquities without damaging the integrity of the whole collection. From the John W. Allen correspondence (which amounted to a single letter), Larson learned that Davis had given the retrieved KV 55 pieces to a distant relative named Jeanette Buttles, who had compiled the catalogue of the collection (with illustrations by her sister Mary) during her tenure as its caretaker. The objects remained at her home in Florence, Italy, until her death sometime in 1956 or 1957. In the summer of 1957, John W. Allen brought the collection of artifacts and the illustrated catalogue back to his home in Tallahassee, and tried, without success, to interest the Oriental Institute in acquiring some (or all) of the objects. Here the matter was dropped, and the trail was 32 years cold when Larson picked it up again. Remarkably, he was able to trace the Davis-Buttles-Allen KV 55 collection an additional step. Martha R. Bell called Larson's attention to a 14 year old Sotheby's sales catalogue, Antiquities (December, 1976, Sale 3934, Sotheby Parke Bernet Inc., New York) which listed the KV 55 artifacts as Lot Numbers 39, 161-164, and 235-250. Further research disclosed that more items from the Davis-Buttles-Allen collection were auctioned in New York by Sotheby's in 1986. Larson records that he contacted Richard M. Keresey, Sotheby's antiquities expert, but was unable to obtain any data on the buyer(s) of the KV 55 collection. However, he later refers to the auctioned gold/enamel necklace element, inscribed on the reverse side with the number 17, as "the piece that went to Cairo," and gives the museum entry number (JdE 39632) for an object now in the Cairo Museum which matches the auctioned item's description (KMT [vol. 1: 2], 44, and 46, n. 19.) Originally part of the necklace found on the KV 55 mummy, the auctioned piece noted by Larson was one of the thirteen objects in Sotheby's Lot # 238 (entitled "Thirteen Gold and Electrum Amulets" in the sales catalogue) which sold in 1976. It was described by Sotheby's as a "gold plaque probably from a collar inlaid with part of a foliate frieze in carnelian and remains of glass paste." Martha Bell discussed the piece catalogued by the Cairo Museum as JdE 39632, and concluded that "Unfortunately, this piece was purchased," (JARCE 27 , 101, and n. 31) and referred to the Andrews diary entry for February 17'th, 1907, mentioned above, which reports the theft and retrieval of a necklace element inscribed on the reverse with a number 17. The Cairo Museum object certainly sounds like the necklace element that was sold by Sotheby's in 1976, but documentary evidence seems to make this far from certain. For example, Daressy lists a necklace element marked on the back with a number 17 in his catalogue (ToQT, 21, item # 10) and this is problematic because it seems to indicate that the particular necklace element he describes had officially been included in the collection of KV 55 objects shipped to the Cairo Museum. However, we have seen (above) that Davis retained the stolen KV 55 objects which he retrieved from dealers, and never sent them to Cairo. The Andrews diary clearly states that such an object had been stolen, and, as has been noted above, Larson found an object fitting the necklace element's description in the Sotheby's 1976 sales catalogue. Could Daressy have prepared his catalogue entry without ever actually seeing the necklace element, using excavation notes written by one of the men who found the piece, unaware that this particular object had subsequently been stolen? Or could there be two similar necklace elements, both with the number 17 inscribed in hieratic on their reverse sides, one of which went to the Cairo Museum, the other eventually ending up at Sotheby's? This is not altogether impossible. Martha Bell describes the Cairo Museum piece as a "single 'bead' from a gold w3h-collar, with a repeated pattern of alternating pendant lotus and poppy (?) petals. The cloisons were inlaid with lapis, turquoise, and carnelian colored materials, probably glass." She explains the hieratic number 17 on the back as a jeweler's mark indicating "position within a row [of necklace elements], the higher the number apparently the smaller the size, i.e. on the outer edges, or rear of the necklace, nearer to the terminal." (JARCE 27 , 101 and n. 32.) This explanation for the purpose of the numerical markings on the back of the Cairo piece leaves room for the possibility that another similarly numbered piece could have occupied the same position on the opposite side of the same string of beads. If two such # 17 pieces were found in KV 55, then one could have been stolen along with other parts of the necklace while the other # 17 piece went to Cairo. The Cairo #17 piece would have been the one catalogued by Daressy and accessioned into the museum's collection as JdE 39632. The stolen #17 piece would have become part of the Davis-Buttles-Allen collection, and eventually ended up at Sotheby's. Bell's comment about the Cairo # 17 piece having been purchased could have been an understandable mistake caused by her confusing the Cairo necklace element with the similarly numbered necklace element reported as stolen by Emma Andrews in her diary. Larson's comment that the Sotheby's necklace element "went to Cairo" may itself be based on his reading of Bell's incorrect statement that the Cairo # 17 piece had been purchased. Only further research can hope to resolve the mystery of the necklace element(s.) If there were two necklace elements, both inscribed with the number 17, then the location of the one auctioned by Sotheby's in 1976 is still unknown. Through C. Lilyquist, M. J. Raven, and H. D. Schneider, Bell learned that another piece from the same necklace (this one with a hieratic number 16 inscribed on the reverse side) had been sold to the Rijksmuseum van Oudheden, Leiden, by J. N. E. Esser, an antiquities dealer in the Netherlands. This object (Leiden F 1940/8.4) had come to Esser from the collection of Baron Van der Straeten-Solvay of Brussels. (JARCE 27 , 101, no. 8 and n. 32. See Lilyquist's photo of the Leiden necklace element.) How the Baron had acquired the piece is currently not known. I recently had a moment of excitement involving my "discovery" of a relative of Theodore Davis. A man by the name of Theodore Davis Boal was mentioned in Davis's New York Times obituary as being a surviving nephew of the famous Egyptologist. His home was given as Boalsburg, Pennsylvania. I began tracking him down on the internet, and soon found a website for a Boalsburg Museum in Boalsburg, PA, near State College. The Museum is run by a Mr. Christopher Lee, Theodore Davis's great-great-nephew. Immediately, I sent Mr. Lee an e-mail, explaining to him that I was doing research on Theodore Davis. I asked if Mr. Lee had any Egyptian artifacts, either in his personal collection or in the museum. He replied that he did have "some items from Egyptian tombs" on display in the museum. Greatly excited, I dashed off e-mails to John Larson and Dennis Forbes. I was ready to drive to Boalsburg to photograph these artifacts when John Larson wrote back, explaining that he and Robert Ritner (now an Associate Professor of Egyptology at the Oriental Institute of Chicago) had seen the objects in 1989, and determined that none had probably come from Davis's excavations in the Valley of the Kings. My visions of discovering the missing KV 55 mummy bands and gold foil sheets vanished like cartouches on the KV 55 coffin. KV 55's missing objects continue to tantalize researchers, and there are many of them still hidden away, mostly in private collections. Martha Bell compiled an extensive list of these articles, which include (in addition to the ones noted above) such things as an alabaster jar stand from the burial chamber, an alabaster vase lid and wooden mallet head from the entrance corridor, and a fragment of furniture bearing the names of Tiye and Nebmaatre (written without employing the M3ct-figure.) (JARCE 27 , 108.) Who knows when or where they may turn up. The search for the elusive KV 55 missing objects continues today, and can be greatly facilitated by internet communications and search capabilities. The Theban Royal Mummy Project would like to especially thank Susan J. Allen, Senior Research Associate & Librarian, Department of Egyptian Art, Metropolitan Museum of Art; Dennis Forbes, editor of KMT: A Modern Journal of Ancient Egypt; John Larson, Museum Archivist of the Oriental Institute of Chicago; and Monica J. Verona of the MMA's Thomas J. Watson Library, who all communicated with me about the Cairo and MMA gold foil sheets and other KV 55-related subjects, and generously shared valuable information. on the menu bar at left.